All right, Folks! Here's the link; click on the picture and it will take you there! 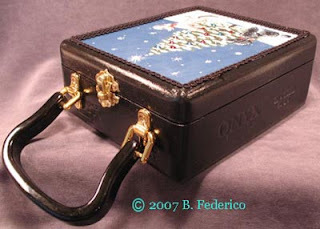 Both cigar box purses I listed this week have Swarovski Crystal Rhinestones, and of course, are one-of-a-kind (OOAK) and hand painted. Fully lined, too! A BIG CONGRATS Becky for being selected as Ehag's December Full~Moon Spotlight on Artist! You are VERY deserving of this accolade! !